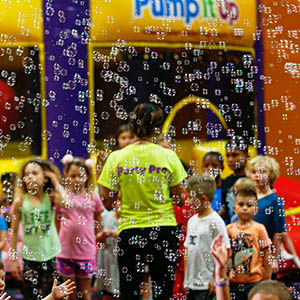 We'll shower the kids with bubbles a few times during your party in the 2nd arena! The kiddo's just love catching the bubbles & popping them before they hit the ground! 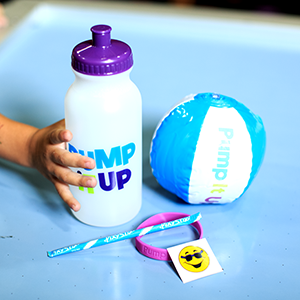 Every child will get a free glow bracelet & use of our Glow Ball Blasters during your private party! For only $49.99 the kids & parents will be easy targets when you rotate into our 2nd arena to experience our awesome Glow & Special effect lighting with glow in the dark blasters & soft pong balls. The kids love it! 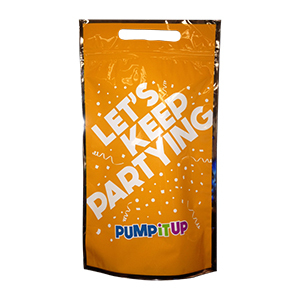 Ask your guests to wear glow friendly clothes to Pump It Up! Includes our Glow Experience & Karaoke! Party like a Rock Star! You and your friends can Jump, Slide, Sing and Dance under our black lights and special effect laser lighting. 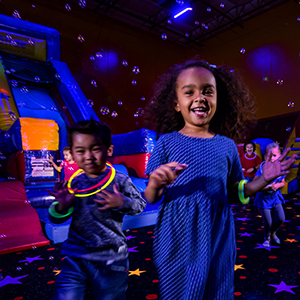 The Jump 'n Jam Glow Party offers all of the same great features as our popular Classic Party with a few twists in our 2nd arena – you get to celebrate under our special effect lights, glow bracelets for each of your friends are included and we'll coordinate some fun games to play in the arena's! Also included is our Karaoke package! Are you up to a sing off? Our Jump 'n Jam Classic Glow Teen/Tween Party is perfect for Teens & Tweens! Great for kids on the go! Water Bottle, Bracelet, foam rocket & pixie stick.